These healthy crock-pot recipes are sure to get your creative juices flowing! Perfect for coming home to a warm dinner on a winters night or in the summertime when it’s too hot to turn the oven on. Healthy crock-pot recipes are a busy person’s best friend. And in the summer when my unvented oven starts pouring heat out of the top of itself the second I turn it on? The crock-pot starts getting pulled out more and more. But the most popular crock-pot recipes are filled with canned soup and high fructose corn syrup packed sauces that we try to stay away from most of the time. No longer! Now we can the crock-pot save the day and dive into these dishes any time of year without fear for our waistlines. All hail the glorious crock-pot! psst…love this post? Follow our Healthy Slow Cooker Pinterest board to find great recipes! A perfect blend of sweet, smokey, earthy and rich spices, this wholesome meal is so easy to make in the crock-pot! This recipe is perfect for cutting down on carbs to slim down or to serve to gluten-free guests! Get the Pulled Pork Lettuce Cup Recipe here. Dry pinto beans and juicy ham hocks crock-pot all day for the perfect easy dinner. Whole 30 approved! Get the Slow Cooker Ham and Beans recipe here. This slow cooker chicken tortilla soup is so easy to put together and has a secret ingredient that makes it creamy and thick with healthy ingredients! Get the slow cooker chicken tortilla soup recipe here. Slow cooker Pumpin Red Lentil Chili has a colorful assortment of vegetables. A super tasty chili recipe that is hard to resist! Get the Full Recipe here. An unconventional take on crock pot recipes, energy bars made in the slow cooker! Get the Full Recipe here. Can you believe that image above is jackfruit and not meat?!? A delicious meatless version of pulled pork – perfect on nachos, as sandwiches and even tacos. I cannot wait to try this. Get the Full Recipe here. A perfect healthy slow cooker recipe for weeknights when you crave something healthy and delicious! Get the Full Recipe here. 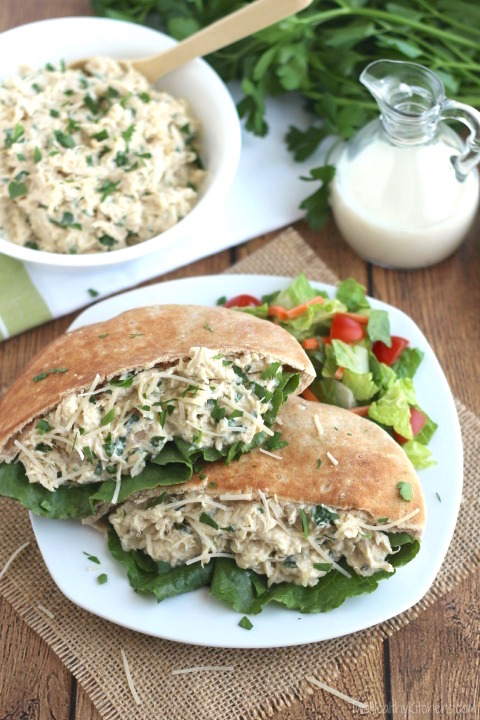 Crockpot chicken sandwiches with home-made caesar dressing and full of protein! Get the Full Recipe here. A budget-friendly, easy and gluten-free slow cooker recipe! Perfect for holiday mornings. Get the Full Recipe here. The great flavors of the Banh Mi sandwiches minus the traditional crusty bread; cooked in the slow cooker with some rice and topped with lightly pickled vegetables and sriracha mayo with Greek yogurt. Get the Full Recipe here. A wholesome healthy slow cooker recipe with Italian barley, smoked turkey sausage and spinach, garnished with fresh basil and Parmesan cheese. Get the Full Recipe here. A healthy and super simple dinner idea where the crock pot does all the work. Individual foil packets make serving and cleaning up a breeze. Get the Full Recipe here. Hearty chicken thighs, loads of spices and lots of sweet butternut squash; this healthy crockpot recipe can be prepped the night before and cooked all day while you are off doing fun things! Get the Full Recipe here. An easy and delicious dinner with tender chicken, creamy sweet corn and jalapeños thrown in the crock pot for a couple of hours. Get the Full Recipe here. An easy and fresh salad with some chicken breasts and a can of beer tossed in the slow cooker, tossed with cilantro vinaigrette and topped with sour cream. Get the Full Recipe here. Slow Cooker Hawaiian Pork Burrito bowls cook all day in a home-made enchilada sauce and are topped with sautéed pears and juicy pineapple. Get the Healthy Slow Cooker Recipe here. These slow cooker garlic honey teriyaki chicken wings are filled with Asian flavors of garlic, honey, ginger and soy sauce. Get the Full Recipe here. A quick and easy version of the Mexican Caldo de Pallo, made with shredded rotisserie chicken. Get the Full Recipe here. An elegant slow cooked meal; Beef Bourguignon adapted for the crock pot. Get the Full Recipe here. A healthy and hearty slow cooker soup, full of vegetables and firm Tofu. Get the Full Recipe here. An easy homemade crockpot recipe with a luscious roasted green tomatillo sauce that slow cooks with pork all day long. Get the Full Recipe here. A must-try crcrockpotecipe with pork shoulders slow cooked in a tasty trio of orange, lemon and lime juice, spiked with onions, jalapenos, herbs, spices and garlic. Get the Full Recipe here. A fresh and light comforting meal with chicken stewed in balsamic vinegar and lots of tomatoes and a sprinkle of basil. Get the Full Recipe here. A savoury and sweet taste of the tropics, this vegan Caribbean Chilli is a class of its own. Get the Full Recipe here. The lip smacking taste of cheeseburgers with the convenience of crock pot cooking, and hidden veggies for some extra nutrition! Get the Full Recipe here. This slow cooker chili is super creamy and spicy. Get the Full Recipe here. These tacos smoke on the grill and then slow cook all day long for the perfect taco filling. Get the Full Recipe Here. This yummy soup is definitely worth the wait! It’s healthy and the slow cooker makes it super simple. Get the Full Recipe here. This healthy and delicious Slow Cooker Carrot Ginger and Red Lentil Soup is a perfect way to make healthy comfort food to share with your family tonight! Get Recipe Here. Taco night just got way easier! This Slow Cooker Mexican Shredded Beef recipe is mouthwatering deliciousness! Get Recipe Here. Spice up your dinner plans tonight with this amazing Crock Pot Low Carb Buffalo Chicken Soup recipe! This healthy slow cooker recipe is sure to be a favorite with your family! Get Recipe Here. Hearty and healthy, this super tasty Bean Soup recipe is sure to disappear in no time tonight! Share this healthy slow cooker recipe with your family! Get Recipe Here. This Grandmother’s Hamburger Soup is simple to make but oh so delicious! This healthy slow cooker recipe is sure to be a favorite around your dinner table tonight! Get Recipe Here. Put your slow cooker to work tonight on this healthy slow cooker recipe while you do the rest of dinner. These Easiest Slow Cooker Sweet Potatoes are sure to go perfectly with just about anything you make tonight! Get Recipe Here. This Crockpot Chipotle Soup is the perfect mix of savory and spice to warm your family up with around the dinner table tonight! Get Recipe Here. Just about everyone can enjoy this flavorful Slow Cooker Creamy Healthy Fall Vegan Sweet Potato Soup recipe! This healthy slow cooker recipe is sure to become a fast favorite at your house! Get Recipe Here. This Slow Cooker Root Vegetable recipe is sure to take center stage at dinner time tonight! Get Recipe Here. Your house is going to smell amazing when you get home to this delicious Slow Cooker Carnitas recipe! This healthy slow cooker recipe is sure to bring them running to the table tonight! Get Recipe Here. This Healthy Slow Cooker Chicken Breast recipe is so flavorful you will forget how healthy it is! Weeknight dinners have met their match with this healthy slow cooker recipe on the menu. Get Recipe Here. This Slow Cooker Mediterranean Chicken is just what you bought your slow cooker for! This amazing dinner idea is sure to blow you away at the dinner table tonight! Get Recipe Here. No one is going to complain about eating their veggies tonight with this Barbecue Chicken Spaghetti Squash Recipe on the table! Get Recipe Here. This Healthy Slow Cooker Granola is so amazing! This healthy slow cooker recipe is going to make you fall in love with your slow cooker all over again! Get Recipe Here. This spicy Mexican Quinoa recipe is sure to have everyone asking for seconds of their veggies tonight! Share this healthy slow cooker recipe with your family tonight! Get Recipe Here. This Thai Curry Spiced Slow Cooker Snack Mix is snacking perfection! It is soooo easy to make in the slow cooker too! Get Recipe Here. Warm up tonight with this Slow Cooker Italian Meatball Soup recipe! This healthy slow cooker recipe is sure to be your new favorite bowl of comfort food! Get Recipe Here. Spice up your dinner plans tonight with this super tasty Slow Cooker Jerk Chicken recipe! This healthy slow cooker recipe is out of this world! Get Recipe Here. Yummm! This Slow Cooker Balsamic Chicken recipe is sure to have your house smelling amazing when you get home tonight! Get Recipe Here. This Moroccan Sweet Potato Lentil Soup is super tasty and almost everyone can enjoy a hot bowl of this tasty comfort food around your table tonight! Get Recipe Here. Yummmmm! This Slow Cooker Korean Beef with Sweet Baby Peppers recipe is going to disappear from your dinner table in no time tonight! This healthy slow cooker recipe is just why you bought a slow cooker! Get Recipe Here. The Best Crockpot Minestrone Soup is super easy to make in the slow cooker and just as delicious as it sounds! Get Recipe Here. What’s your favorite healthy crock-pot recipe to feed your family? Drop us a link in the comments so we can check it out! You made it to the bottom! Follow our Healthy Slow Cooker Pinterest board to get even more great healthy crock-pot recipes in your Pinterest feed! is your 27 Healthy Slow Cooker Recipes book for sale? or do I have to print them out? This is a roundup so it’s not a book. Each image links to the recipe on a variety of sites we just put this list together of ones we like. Hope that helps! I want to try ALL of these delicious recipes! Thanks for including me! Pinned! so many good ones to try!!! thanks for including me! Great round up, my slow cooker is never put away, in the process of making a beef dip as we speak. Everything here lookds delish!